As someone mentioned in the question above, some 'friendly' spells (Calm Emotion, IIRC) specify that one can choose to fail the saving throw. In this case, the allowance makes sense, given that the spell has both a 'defensive' component--removes fear, charm--and an 'offensive' one--reduce aggro/threat, if you will. However, Banishment, and most other spells that require saves, are (meant as) offensive spells, so, it wouldn't make sense to allow the target to choose to fail the save--at least not explicitly. Can someone choose to fail a saving throw even for these spells? The specific case that comes to mind (as per the question linked above) is using Banishment to return yourself to your native plane: if you are somehow transported to a different plane, casting Banishment on yourself, failing the throw, and then maintaining concentration for one minute should return you permanently to your native plane. Considering non-spell saves/'defenses,' it seems that one can choose to fail (insofar as verisimilitude is a factor): a warrior can drop his shield, stand still, and allow his/her enemy to strike them down (effectively setting their AC to 0, so to speak, or even adopting/mimicking the Incapacitated condition); a PC making a strength check/contest can choose to give in/stop exerting strength; and the infamous/contentious issue (at least, in 4E I believe it was so), any character can presumably choose to hurt themselves with their own weapons, even if the PHB doesn't have a rule for it. On March 10, 2016, Jeremy Crawford tweeted, "No rule lets you opt to fail a save. As DM, I might allow it, assuming you aren't incapacitated or dominated." Mike Mearls also said that he would allow it (as a DM). Willingly failing a saving throw is a house rule that the designers are okay with, but it is a house rule. Strict RAW does not allow it. In general, you worry about DC, Saving throws, and AC only in situations where there are two opposing views of what should or can happen. Unless you have some sort of magical shield which actually has a chance to prevent the magic from happening, (Like a partial anti-magic sphere or something) there is no reason to ask someone to roll a saving throw when they wish the spell to effect them. A saving throw—also called a save—represents an attempt to resist a spell, a trap, a poison, a disease, or a similar threat. You don't normally decide to make a saving throw, you are forced to make one because your character or monster is at risk of harm. Unlike most contests, and attacks, saving throws are not an active Action by the player. They are a response to an event, but that response is a representation of your characters decision to attempt to avoid the consequences. In general, if you are not attempting to do something, there is no need to roll. The alternative, puts you in this strange rules space which reminds me of a funny comic I saw. Aragorn was riding a warg that was out of control and was heading towards a cliff edge. He wished to fall off the warg, to which the DM demanded an riding check. 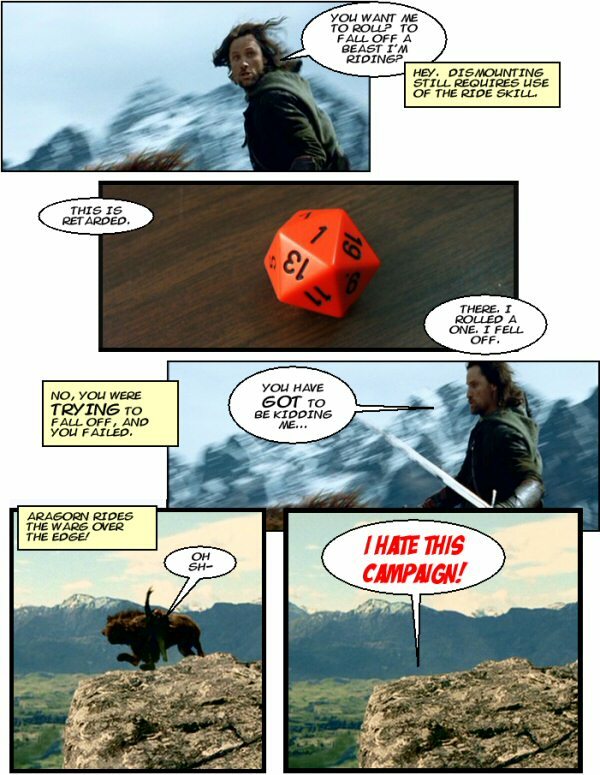 The Player rolled a 1, and "failed to fall off the warg", resulting in him falling off the cliff with the warg. I don't see a rule which allows you to intentionally fail a saving throw, except for the nebulous language of "don't normally decide to make a saving throw" on page 179 of the PH, or "a target can make a saving throw to avoid some or all of spell's effects" on page 205 (emphasis added). That wording leaves a lot of room for interpretation at the individual table. As a DM, I think I'd rule this spell by spell, based on the description and the particular save required. For some effects, where a Strength saving throw is required, it seems logical that you could just relax instead of resisting. Intelligence saving throws imply active mental effort to me. I think that in general I'd allow these to be failed intentionally with no question. By contrast, Wisdom saving throws seem like the mental equivalent of constitution (even if that analogy doesn't hold up completely in other uses of the abilities). For something like Charm Person, you either naturally see through the magic, or you are taken by it. If you choose to ignore your natural perception, you can pretend to be charmed all you like (maybe even to yourself?) but, just as you can't get drunk by failing a saving throw against a thimbleful of wine, you can't make yourself get charmed. And that leaves Charisma, which is the save for the example Banishment. I could go either way with these, really. How much under one's own control is one's force of personality? Arguably, not very much at all. On the other hand, most charisma checks are quite active, and it might make sense for saves to represent a battle of personality — which could be given up. I guess if we go for a complete physical-metal stats parallelism, the above mappings put Str and Int on one boat (active), and Con and Wis in another together (out of your control), which would make Cha the Dex of mental saves... I kind of like that idea: you might reflexively resist being Banished, and might even have to strongly resist all of your instincts to not, but if you're prepared, you could force yourself to give it up. But whichever way, I'd make sure to make a consistent decision for how it works for a given game or campaign, and stick with it. There is no specific way to pass on or intentionally fail a saving throw given. You don’t normally decide to make a saving throw; you are forced to make one because your character or monster is at risk of harm. (BD&D 62). I'd take this to mean that you're forced to make the saving throw even if you'd rather decline it (that's not quite the intent of the text, but should work both ways). Personally, as the DM I would allow the creature to take disadvantage on the save, but not escape it entirely or intentionally fail it..
And spells that allow for willing failure such as Calm Emotions. Re: your examples of non-spell instances that may allow for the reduction of defenses, outright failures. I don't think they're comparable here. They might be useful comparisons, but the spells do for the most part read "the target must make a saving throw." I would consider allowing disadvantage on the save to model the target laying down a-la mimicking allowing yourself to be hit by an attack (again, giving advantage to the attacker). This allows for some chance to miss you (albeit a small one), in large part because the save models both your active defenses and your passive ones (like instinctual response/fight or flight etc), and several elements of chance beyond your own ability/choice to dodge (your ability to dodge is summed up in your saving throw modifier, so you might be able to remove that if you really wanted to take the hit, but I'd generally think disadvantage would be sufficient to properly modify the effect). You don't normally choose to make a saving throw; you are forced to make one because your character or monster is at risk of harm. This says that you can't normally choose to make a saving throw. Choosing to fail a saving throw would be choosing not to make one, effectively. The text says that you are forced to make one, however, so choosing not to does not seem possible. Many spells specify that a target can make a saving throw to avoid some or all of the effects. This is less clear due to the use of the word 'can', however it doesn't provide any explicit exceptions to the general rule, so I would assume that it is not meant provide a choice. a creature can choose to fail this saving throw if it wishes. The use of the word 'this' suggests that the choice provided applies specifically to the spell it appears in. This is the only explicit exception to the general rule provided. Therefore, I would conclude that this choice is only provided where it is specifically stated. As wax eagle pointed out in his answer, many spells use the phrasing, 'the target must make a saving throw', which is entirely unambiguous if you accept that choosing to fail a saving throw is the same as choosing not to make one. Note that Jeremy Crawford, official source of rules interpretations, says that "no rule lets you opt to fail a save." If you wanted to allow a player to fail a saving throw, that's up to you as the DM. It's worth pointing out, though, that some saving throws are, realistically, impossible to deliberately fail. You can't choose to have your body accept a disease or poison without fighting it. Likewise, it may not be possible to 'allow' yourself to be banished. Even some Dex saves may be involuntary - the body automatically flinches back from many things, like intense heat. I prefer a bit of realism in my games so, personally, I try to avoid any rules in the book that are a bit grey. They usually end up with arguments about details that aren't helpful to any gaming group. As a result, I actively ignore the idea of whether a saving throw can be voluntarily failed (and a number of complications besides that!). I actively try to find good reasons for something to work according to the expectations of my friends playing the game. I always ask for saving throws for any spell-like/dramatic events (as long as they legitimately hit the individual - that's another story though!). I just try and work out an appropriate bonus to add to the throw to mimic how "open" the characters are to accepting the effects and also cover the difficulty of the circumstances. In combat, that often becomes normal saving throws. Out of combat, it's often a mix of player requests and situation thinking. If you play saving throws that way, then you can factor in racial, trait, situation and item bonuses to end up with a saving throw that covers all the subtle needs of the situation, story needs and leaves the little bit of risk of a "fumble" . I'd agree with him easily. A character can't turn off their immune system. As some races have disease bonuses then they can't also just mentally turn them off. In this situation I'd add any disease resistance bonuses/penalties and then add a penalty for any character who actively started doing things like starving themselves or causing themselves harm. Just lieing down in a corner and willing themselves to contract the disease wouldn't trigger me to give them a bonus until it had the same effects as malnutrition. i) A fighter is still a muscle-bound hero, even if he/she relaxes they're still 180 pounds of muscle that has mass. ii) A mage can relax their mind but they aren't in control of their heavily developed sub-conscious and can't be dumber just by relaxing. iii) A cleric is not likely to suddenly become naive just by thinking about it and be able to lose his wisdom. iv) A thief will react with cat-like responses whether he tries to keep still or not. v) A paladin/rogue will be imbued with self-confidence and presence that won't hide under a bushel on request. 4) mattdm also mentions getting drunk with a thimble-full of alcohol. Another good example from mattdm. Sometimes, you have to rationalize the rules. I'd give a big bonus to any character of stout nature, solid constitution or having a good role-playing reason that covers resistance to alcohol. Not the answer you're looking for? Browse other questions tagged dnd-5e saving-throw or ask your own question. What to do when someone's attacking you, but succeeding the save is worse than failing it? What's the maximum (average) damage that can be dealt in one round by a 20th level character with at least two levels of Fighter? Does Evasion allow half damage even when unconscious? How would using Thunderwave to stop falling damage work? Do Saving Throw Bonuses Apply to Death Saving Throws? Do you regain consciousness immediately after rolling a 20 on a death saving throw? Is “Bowgentle's Fleeting Journey” overpowered as a 5th-level spell? When do I roll a Saving Throw? DC 21 Wisdom Saving Throw against fear- do I just always fail? Can you be given a disadvantage on a saving throw if you are surprised? Can you get more than three saving throw proficiencies? Can creatures with Spell Resistance voluntarily fail saving throws? How does the Banishment spell interact with other spells that trigger when entering a space?